Today, Amazon introduced Echo Show, a new device that brings you everything you love about Alexa, and now she can show you things. We are also excited to announce that we are adding new capabilities to the Alexa Skills Kit that will enable you to optimize your skills for the screen and connect smart home cameras to Alexa. Sign up to be notified when these features become available. 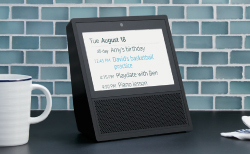 With Echo Show, customers can watch video flash briefings and YouTube, and see music lyrics, smart home cameras, photos, weather forecasts, to-do and shopping lists, and more. Visit the Echo Show product page on Amazon.com to pre-order the device, see specs, and learn more. Alexa, Amazon’s cloud-based voice service, already powers voice experiences on Amazon Echo, Echo Dot, Amazon Fire TV and all devices powered by the Alexa Voice Service. Alexa has over 12,000 skills created by developers like you. All Alexa skills will automatically be available on Echo Show. Skills will display any skill cards you currently return in your response objects. This is very similar to how customers see your Alexa skill cards on the Alexa app, Fire TV, and Fire Tablet devices today. If no skill card is available, a default template shows the skill icon and skill name. Effective skill cards help increase customer engagement with your skill across devices with screens. If you haven’t yet optimized your skill cards for the screen, be sure to check out our best practices for skill card design. Soon, we’ll make updates to the Alexa Skills Kit that make it easy for you to optimize your skills for the screen or connect smart home cameras to Alexa. Build Optimized Display and Video Interfaces. While your skills will work out of the box, we know that you may want to create visual experiences unique to Echo Show. You develop skills for Echo Show in the Alexa Skills Kit, just like you do for other Alexa devices with a screen today. When we introduce display interfaces in ASK later this summer, you’ll be able to choose from several GUI templates for your skill. You will also be able to stream videos on Echo Show using the new video player interfaces in the Alexa Skills Kit. You will simply provide a URL and other details of your video in your skill response. We’ll render the video on the device and allow customers to control the playback using both voice and touch interfaces. Enable Customers to View Smart Home Cameras. With Echo Show customers can say, “Alexa, show the baby’s room” and have the feed from an Internet connected camera, like Arlo, display on Echo Show. To support this, we are introducing cameras as part of the Smart Home Skill API. Because the Smart Home Skill API taps into Amazon’s standardized Alexa language model, you won’t need to build the voice interaction model for your camera skill. Alexa will understand the customer’s speech, convert it to directive, and send that directive to your skill adapter. Your skill adapter will return the video feed URI from the requested camera. The URI is then passed to the Echo Show device so it can directly display the video. Sign up now to get updates when these features become available. Developers have built more than 12,000 skills with ASK. Explore the stories behind some of these innovations, then start building your own skill. Once you publish your skill, mark the occasion with an Alexa dev shirt.